Today I have the honor of having Billie of A Life of Grace and Bliss guest posting for me. Do you love the sights and smells of autumn? There is just something welcoming and relaxing about a nice fall scent. I'm thinking apples, cinnamon, cloves, the smell of a crisp fall morning, the smell of the fire place burning briskly... ahhh! It makes me want to hibernate in all the loveliness! Do you know that a lot of candles you burn in your home and potpourri scents are toxic? 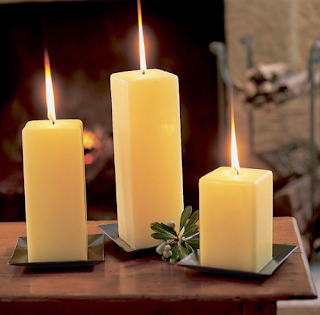 Paraffin is the major ingredient in most candles. Paraffin is a waste product of the petroleum industry! It releases carcinogenic chemicals when it's burned! Two particularly toxic chemicals are benzene and toluene. Benzene is cancer-causing and Toluene is known to affect the central nervous system. But you can still have that wonderful aroma in your home without the risk of toxins! One way is what I like to call a simmer pot! A simmer pot can be one of those tiny crocks used for store-bought liquid potpourri, or as simple as a small kitchen sauce pot you place on the stove. Just add a little water, some cinnamon sticks (you can buy these inexpensively at craft stores!) or some whole cloves from the spice aisle at the grocery! Juicing an orange for breakfast? Dice the remainder and add it to the pot. Add some water and simmer away to create a fresh fragrance in your home. Another way is by creating what are called fragrance stones: I saved this article from a fall-themed magazine several years ago - and it's a fun project to do with your kiddos, too. Especially if they enjoy play dough activities! 2. Stir in fragrance oil and coloring to boiling water and pour over the dry ingredients. 3. Stir until a ball of dough is formed. 4. Knead the dough until it is smooth like pastry dough. 5. Pinch pieces of the dough off the main ball and roll into small balls. You can make them any size you like. 6. You can also roll the dough out and cut it with cookie cutters at this point. 7. Let dry completely before using or giving. You can use essential oils (found at health food stores, or the organic section of your regular supermarket) for an all natural product or you can buy fragrance oils that are meant for soap and home made candles. These oils can be found at craft stores like Michael's and Ben Franklin Stores. You can also mix your own custom scents from either the essential oils or the fragrance oils. I hope you'll find time to try this fun project. These are cute packaged in tissue paper tied with a ribbon, placed in a clear cellophane bag, or as an addition to a gift basket. Teachers LOVE them! And they are NON-toxic! Awesome Billie! Thanks for coming by. I know so many people love having fragrance in their home, thank you for giving us a non-toxic solution!